My name is Nina and I am a professional dressmaker from Toronto. Every woman in my family was clever with a needle, and I follow my family tradition. I have been designing and making clothes since I was a teenager and now I have many years’ experience to call upon. Do you have a feeling that your closet is full, but there is nothing to wear? Would you like to adjust your ready-made clothes to fit your figure like a second skin? I can upgrade your existing wardrobe to meet current styles. 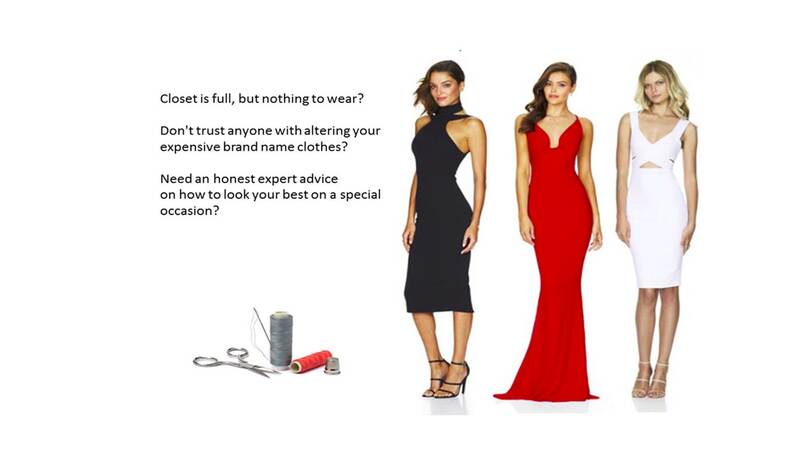 For professional quality, affordable alterations, whether simple or complex, please email me at nina@perfectfitforyou.com. Email is the fastest way to reach me. I work by appointment only, and don’t take calls when I am with clients. My prices are reasonable (check out my Pricelist ). I value my clients’ time, so even if you have tight deadlines, I guarantee to meet them. You can fit your visit into your busy schedule, because I accept clients on evenings and weekends. You save up to 200% on the price of fabric and accessories – not only I show you where to buy them at shockingly lower prices, I will cut economically using my know-how that I have created over the decades of working as a dressmaker. I work by e-mail and Skype, so I save you unnecessary visits by staying connected with you when you have questions or need my assistance. Inspiration, imagination, and experience combined enable me to make very complex alterations on all kinds of clothes made from any material. I used to design and make clothes customized to your style and tailored to all types of figures. Now I focus mostly on complex alterations, because unlimited number of designs and clothes are available online and at the stores, so alterations is the way to go, as opposed to making dresses from scratch. Modern dresses contain several layers. Purchased online, most of the time they don’t fit. When people search for a Toronto seamstress, they don’t realize that seamstresses are not trained to do this kind of work. They need a dressmaker to save their dresses. I welcome challenge – clients with special requirements are my specialty. I have created dresses for models that have won top prizes in international fashion competitions. But I have been equally proud to have helped women, who gained a lot of weight, look and feel great for their special occasions. We are all different and we are all beautiful, and this is my job as a dressmaker to make your clothes highlight your beauty and make you feel special. …Fashions come and go, clients stay. P.S. Looking for a seamstress in North York, Yorkville, Davenport, Hillcrest, Forest Hill, Annex? My clients come from as far as Durham region, Milton, Ottawa, Calgary, even Boston and New York, but you are much closer than that! My shop is conveniently located south of Bayview and Davisville ( north of St. Clair), at Bayview and Moore, and is accessible by TTC and car from many locations in Toronto and GTA. My clients drop off bags of clothes that need to be altered, and pick them up at their convenience. They go extra mile to bring their business to me, and I go extra mile to make them happy and satisfied. P.P.S. I will help you to look slimmer by designing and altering clothes for you – but what if you want to GET slimmer? Try eating healthy foods – it is the only sure way to lose your weight without losing your health. Go to www.Choose-Healthy-Food.com and find out about benefits of eating right and a lot of easy healthy delicious recipes! Isn’t it amazing how great haircut and hair style makes you feel confident and gorgeous, and how bad one can be a traumatic experience? If you are in Toronto, don’t second guess – book an appointment at Caprice salon. Its owner and artistic director, Marina Boukin, is a great master, winner of many awards, and a humble, humorous, creative person. If you have a vision, she will make it work; if you don’t, she will find the style that suits you best.